Many climbers experience the 3rd Flatiron's East Face and the 1st Flatiron's Direct East Face or Fandango and look for further experiences like those. While those routes are stellar, much of the Flatirons could feel anti-climatic if you don't pick and choose the best follow-up routes. Mediocre rock quality, challenging routefinding, unplanned runouts, bushwhacking, missing anchors, and raptor closures can easily ruin a day. Don't fear. 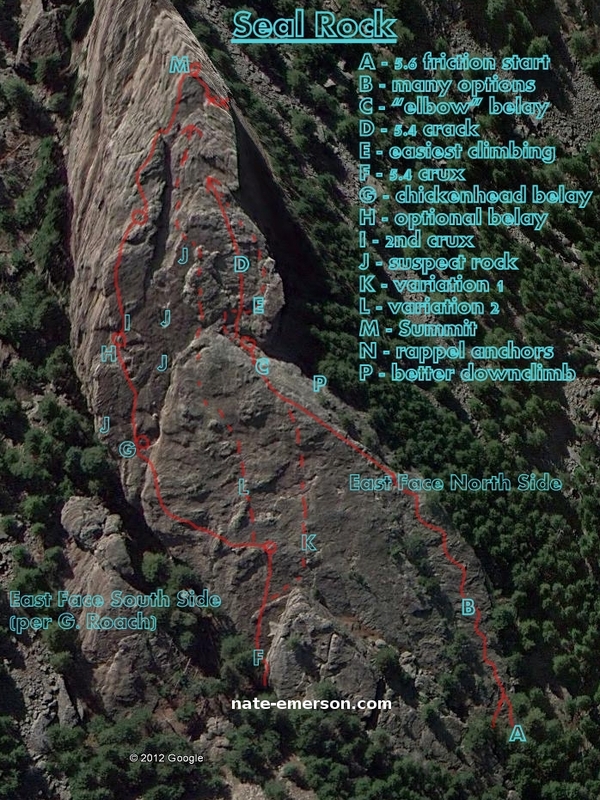 There are routes offering the same quality as the 1st and 3rd at similar climbing difficulty, and Seal Rock is a great pick that offers a couple of excellent easy routes. Seal Rock is less than 2 miles hiking from the parking on Bear Mountain Drive or NCAR on Table Mesa. From Bear Mountain Drive to the base of Seal Rock's East Face North Side route, it is about 1100ft of elevation gain and 1.8 miles. It's only 700ft and 1.7 miles from NCAR, but you will have 275ft of uphill on the return after your climb, versus a "coast" down the Bear Canyon trail to Bear Mountain Drive. Consider these details when choosing where you want to park. This extra mile on the approach, plus a little more elevation (250ft for the 1st Flatiron, 100ft for the 3rd Flatiron) keeps the crowds to a minimum on Seal Rock. Most of the approach is on maintained trail, with the final approach on well-established climbers trail starting just after the Mesa trail branches off of the Bear Canyon trail. Look for the climbers trail on the steep embankment on the right in about 100yds from the trail split. After heading up the climbers trail for a few hundred feet, you can see the Harmon Cave on the right. The trail branches left, it can become a little more challenging to follow from this point. Make sure to follow the trail to the Seal, and don't get on the Pup, a dirty flatironette immediately east of the Seal. 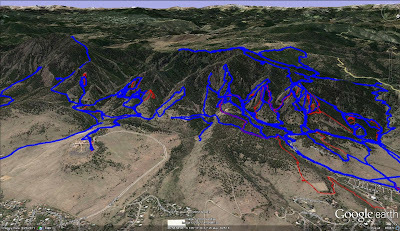 Here's an image of a bunch of the KML files I've recorded over the past year or so in the northern half of the Flatirons. These tracks were recorded while working or doing running/scrambling workouts.